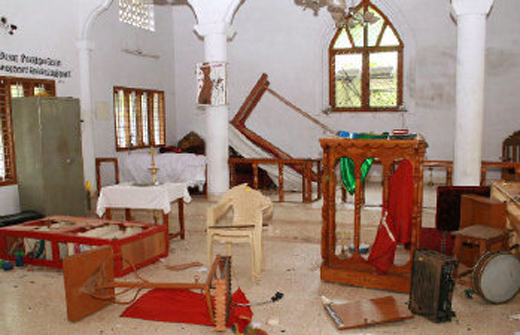 Mangalore, Oct 17, 2014: The Karnataka State cabinet on Thursday Ocober 16 rejected controversial reports on church attacks submitted by justice B KSomashekar Commission of Inquiry and decided to implement the National Human Rights Commission’s (NHRC) recommendations which includes taking action against pro-Hindutva groups responsible for the incidents. Briefing reporters after the Cabinet meeting, Law Minister T B Jayachandra said the NHRC had made nine recommendations following the attacks that occurred in various parts of Dakshina Kannada district in 2008. The State Home Ministry has been directed to take steps to implement them. The NHRC has recommended booking of cases against those responsible for the attacks and action against police personnel who beat up Christians. Protection to churches, compensation to the victims and training the police in handling human rights issues are some of its other recommendations. “Findings of the preliminary and final reports of the (judicial) commission were contradictory. The commission had, in its preliminary report, stated that certain Hindu groups might be responsible for the attacks. But it did not indict anybody in its final report. It was obvious that the reports were politically motivated. Hence, the Cabinet decided to reject them,” he explained. The previous BJP government had ordered the judicial inquiry by retired Karnataka High Court judge B K Somashekar. In its interim report submitted in February 2010, the commission squarely blamed the Bajrang Dal, Vishwa Hindu Parishad and the Sri Ram Sena. It found that the district administration, including the police, had colluded with the attackers at that point of time. However, in its final report submitted in January 2011, the commission gave a clean chit to the then government and vaguely blamed “misguided fundamentalist elements” for the attacks. Justice Somashekar himself stated that there was no basis for apprehensions that any Hindu group was responsible for the incidents. The final report also stated that the commission saw no merit in the allegation that the police and the district administration had colluded in attacking churches IN 2008.